Skateboarding—often portrayed in the media as an extreme sport—can be a form of art, a hobby, or a method of transportation. Skateboarding has been shaped and influenced by many skateboarders throughout the years. A 2002 report by American Sports Data found that there were 12.5 million skateboarders in the world. Eighty percent of skateboarders polled who had used a board in the last year were under the age of 18, and 74 percent were male. Skateboarding is a relatively modern sport—it originated as "sidewalk surfing" in the United States—particularly California—in the 1950s. A key skateboarding trick, the ollie, was only developed in the late 1970s. The first skateboard was made sometime in the 1950s and coincided with the initial popularization of surfing in California. The earliest skateboards were homemade and constructed of flat wooden planks attached to roller-skate trucks and wheels. Skateboarding was originally called "sidewalk surfing," and early skaters emulated surfing style and moves. Skateboards may or may not have evolved from "crate scooters." Crate scooters preceded skateboards, and were essentially similar except for having a wooden crate attached to the front, which formed rudimentary handlebars. The 1950s marked the first time that the skateboard was a commercial interest, and in 1959, the first skateboard appeared for sale. The reason skateboards became popular were mainly due to the shared market with surfers. Surfers felt that there was no better way to practice surfing movement off the beach than with the skateboard. With the surfing crowd behind them, some surfing manufacturers like Makaha and Hobie decided to build plastic skateboards that looked like a smaller version of a surfboard. The popularity of skateboarding at this time spawned a national magazine, The Quarterly Skateboarder, and the 1965 international championships were broadcast on national television. The growth of skateboarding at this time can also be seen in Makaha's sales figures which quoted $4 million worth of board sales between 1963 and 1965 (Weyland, 2002:28). Yet by 1966 sales had dropped significantly (ibid) and Skateboarder Magazine had stopped publication. Skateboarding's popularity dropped and remained low until the early 1970s. The main reason for this was because of bad design and lack of safety features. Once skateboarders started to get hurt, cities banned skateboarding and it led to too much inventory for the companies that first manufactured them. In the early 1970s, a surfer named Frank Nasworthy was visiting a friend in Virgina when he discovered urethane roller skating wheels at a backyard shop. Frank decided to take 30 sets of wheels to try them out on a skateboard, and the results were incredible. "We had free rein over the entire Washington, DC area," he said. Frank's wheels were far superior to the clay wheels introduced previously because they gave the skater better handling and they could roll over small obstacles in the road. The improvement in traction and performance was so immense that from the wheel's release in 1974, the popularity of skateboarding started to rise rapidly again, and companies wanted to invest more in product development. Manufacturers started to experiment with more exotic composites and metals, like fiberglass and aluminum, but the common skateboards were made of maple plywood. The skateboarders took advantage of the improved handling of their skateboards and started inventing new tricks. Suddenly for the first time in the history of skateboarding, outdoor skate parks were created, leading to a meeting place for aficionados of the sport. Before skate parks were built, skaters had a hard time finding legal places to skate, but the boom of skate parks opened the door for skaters to develop their skills. Another important development in skateboarding came about by accident. Skateboarders, most notably Ty Page, Bruce Logan, Bobby Piercy, Kevin Reed, and the Z-Boys, started to skate the vertical walls of swimming pools that were left empty in the 1976 California drought. This started the "vert" trend in skateboarding. With increased control, vert skaters could skate faster and perform more dangerous tricks, such as slash grinds and frontside/backside airs. With more dangerous tricks in play, liability concerns and increased insurance costs to skate park owners created a downside for the industry. With safety at the forefront, improved knee pads that had a hard sliding cap and strong strapping were developed (first by Norcon, then more successfully by Rector), but proved to be too little too late. Skate parks increasingly had to contend with high-liability costs. Also, during this era, the "freestyle" movement in skateboarding began to splinter off and develop into a much more specialized discipline, characterized by the development of a wide assortment of flat-ground tricks. Vert skaters started making their own ramps and free-stylers didn't need skate parks. This led to the closing of many parks. By the beginning of the 1980s, skateboarding had died again. A skater does a pivot stall, a lip trick. The third skateboard generation occurred from 1983 to 1991, and it was during this time that street skating became the main focus. In the early 1980s the legal issues of skateboarding and the popularity of BMX biking were the main reasons for the second fallout for skateboarding. Events and contests were still being held, but attendance was small, and prize money was non-existent. This started to change in 1981, when a group of die-hard skaters started publication on a new magazine called Thraser. The magazine gave readers information on the skateboard scene, and the sport's popularity started to increase. In 1983, skateboarding manufacturers noticed the upward trend, and Transworld Skateboarding magazine was introduced. Vert riding took over in 1984, and more and more skaters were skating on launch ramps and developing aerial moves. The focus on vert riding was due to the invention of the no-hands aerial (later known as the ollie) by Alan Gelfand in Florida, in 1976, and the almost parallel development of the grabbed aerial by George Orton and Tony Alva in California. Street skating gained popularity in the mid to late 1980s, and pro skaters decided to leave large manufactures and start their own skate businesses. One of the first to make the switch was Steve Rocco, who started World Industries, one of the new companies who started the trend toward "new school" skateboarding. Since few skate parks were available to skaters at this time, street skating pushed skaters to seek out shopping centers and public and private property for places to skate. By the time 1991 came, a worldwide recession hit, causing the skate industry to have to find a way to reinvent itself again. Public opposition, and the threat of lawsuits, forced businesses and property owners to ban skateboarding on their property. By 1992, only a small fraction of skateboarders remained as a highly technical version of street skating, combined with the decline of vert skating, produced a sport that lacked the mainstream appeal to attract new skaters. 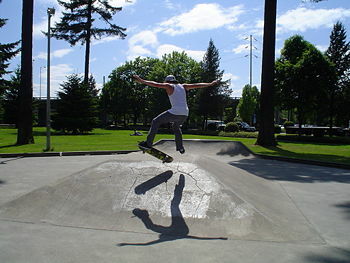 Teen skater in Salem, Oregon, May, 2007. The fourth and current generation of skateboards is dominated by street skating. During the early times of this period starting in 1993, skateboarding had to compete with rollerblading and the economic recession. By the mid-1990s, the rise of cable television and the internet led to increased awareness of the sport. 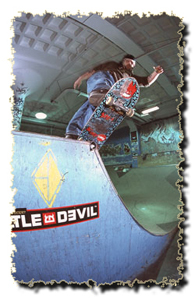 This helped the sport to reemerge once again, and by 1995, skateboarding was a staple of the ESPN 2 Extreme Games. Public skateboard parks were built once again in California, and from the start of the generation until now, skateboarding has continued to have success in its current era. While street skateboarding remains popular, its rigid conformity and high attrition rate does not appeal to everyone, and there is a resurgence of other types of skateboarding. Longboarding, speedboarding, downhill sliding, pool or bowl skating, slalom, and ditch skateboarding are thriving all over the world, albeit below the radar. A skater performs a kickflip over an 11-set of stairs. With the evolution of skateparks and ramp riding, the skateboard began to change. Early skate tricks had consisted mainly of two-dimensional maneuvers for example, riding on only two wheels (wheelie), spinning like an ice skater on the back wheels (a 360 pivot), high jumping over a bar (nowadays called a "Hippie Jump"), long jumping from one board to another (often over a line of small barrels or fearless teenagers lying on their backs), and slalom. In 1976, skateboarding was transformed by the invention of the first modern skateboarding trick by Alan "Ollie" Gelfand. It remained largely a unique Florida trick from 1976 until the summer of 1978, when Gelfand made his first visit to California. Gelfand and his revolutionary maneuver caught the attention of the West Coast skaters and the media where it began to spread worldwide. An ollie is performed by popping the tail of the skateboard, sliding the front foot towards the nose and lifting up the back foot to level the skateboard out. This results in the skateboarder, along with his or her skateboard, lifting into the air without the aid of foot straps or the skateboarder's hands. The "ollie" was reinvented by Rodney Mullen in 1981, who adapted it to freestyle skating by "ollieing" on flat ground rather than out of a vert ramp. Mullen also invented the ollie kickflip, which, at the time of its invention, was dubbed the "magic flip." The flat ground ollie allowed skateboarders to perform tricks in mid-air without any more equipment than the skateboard itself. The development of these complex tricks by Rodney Mullen and others transformed skateboarding. Skateboarders began performing their tricks down stair sets and on other urban obstacles–they were no longer confined to empty pools and expensive wooden ramps. 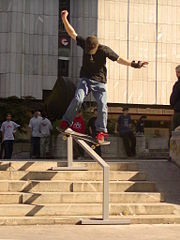 The act of "ollieing" onto an obstacle and sliding along it on the trucks of the board is known as grinding, and has become a mainstay of modern skateboarding. Types of grinds include the 50-50 grind (balancing on the front and back trucks while grinding a rail), the 5-0 grind (balancing on only the back truck while grinding a rail), the nose grind (balancing on only the front truck while grinding a rail), and the crooked grind (balancing on the front truck at an angle while grinding) among many others. There are various other grinds that involve touching both the trucks and the deck to the rail, ledge, or lip. The most common of these is the smith grind, in which the rider balances over the back truck while touching the outer middle of the board to the grinding surface in the direction from which he or she ollied. Popping and landing on the back truck and touching the inner edge of the board, i.e., popping "over," is known as a feeble grind. Boardslides, lipslides, noseslides, and tailslides are on the wooden deck of the skateboard, rather than on the trucks. The image of the skateboarder as a rebellious, non-conforming youth has faded in recent years. The rift between the old image of skateboarding and a newer one is quite visible: Magazines such as Thrasher portray skateboarding as dirty, rebellious, and still firmly tied to punk, while other publications, Transworld Skateboarding for example, paint a more modern, diverse, and controlled picture of skateboarding stars. Furthermore, as more professional skaters use hip hop music accompaniment in their videos, many urban youths and hip-hop fans are drawn to skateboarding, further diluting the sport's punk image. Films such as Dishdogz (2005) have helped improve the reputation of skateboarding youth, depicting individuals of this subculture as having a positive outlook on life, prone to poking harmless fun at each other, and engaging in healthy sportsman's competition. According to the film, lack of respect, egotism, and hostility towards fellow skateboarders is generally frowned upon, albeit each of the characters (and as such, proxies of the "stereotypical" skateboarder) have a firm disrespect for authority and for rules in general. Group spirit is supposed to heavily influence the members of this community. In presentations of this sort, showcasing of criminal tendencies is absent, and no attempt is made to tie extreme sports to any kind of illegal activity. Skateboarding has long been a male-dominated sport; a survey in 2002, estimated that only 26 percent of skateboarders were female. In the early years of the sport, few female skaters gained widespread visibility; Peggy Oki, Ellen O'Neal, and Ellen Berryman were a few who achieved fame in the 1970s. The skateboarding boom in the 1990s, coupled with an overall advancement in womens' sports, produced more female skaters than in previous decades. Skaters such as Elissa Steamer and Cara-Beth Burnside elevated women's skateboarding to a new level. This trend continued into the new millennium with Amy Caron, Vanessa Torres, and Lyn-z Adams Hawkins. Presently, skateboarding competitions for women can be seen at all major skateboarding events, such as the X-games, the Gravity Games, and the Slam City Jam. There are many female-only skate companies, sessions, and camps to help advance the female skateboarding movement. An alliance of professional female skaters has also been established. There have been two major skate films focusing on female skaters: Getting Nowhere Faster and AKA: Girl Skater. Many novice and amateur skateboarding teams have emerged in the last ten years, consisting of groups of talented skateboarders. These are most popular in the United States, where skateboarding started. ↑ Webdelsol.com, Extreme Market Research. Retrieved October 29, 2007. ↑ Your Questions Answered, Statistics about skateboarders. Retrieved October 29, 2007. ↑ Stakeboarding, Skateboarding: A Brief History. Retrieved October 29, 2007. ↑ Skate Log, Skateboarding History. Retrieved October 29, 2007. ↑ Brooke, The Concrete Wave. ↑ Skateboard Historian, History of Skateboarding. Retrieved October 29, 2007. ↑ Skateboarding.com, Gasbag—Transworld Skateboarding. Retrieved October 29, 2007. ↑ Action Sports Alliance, Homepage. Retrieved October 29, 2007. ↑ AKA: Girl Skater, Homepage. Retrieved October 29, 2007. This page was last modified on 2 April 2008, at 16:31.